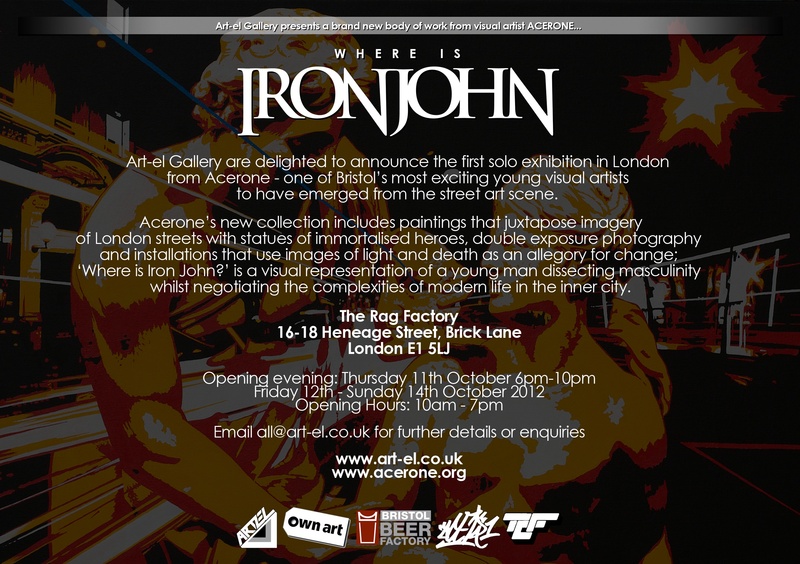 Acerone (Luke Palmer) solo show – Where Is Iron John? Art-el Gallery is delighted to announce the first solo London exhibition from one of Bristol’s most exciting young visual artists to have emerged from the street art scene, Acerone (Luke Palmer). 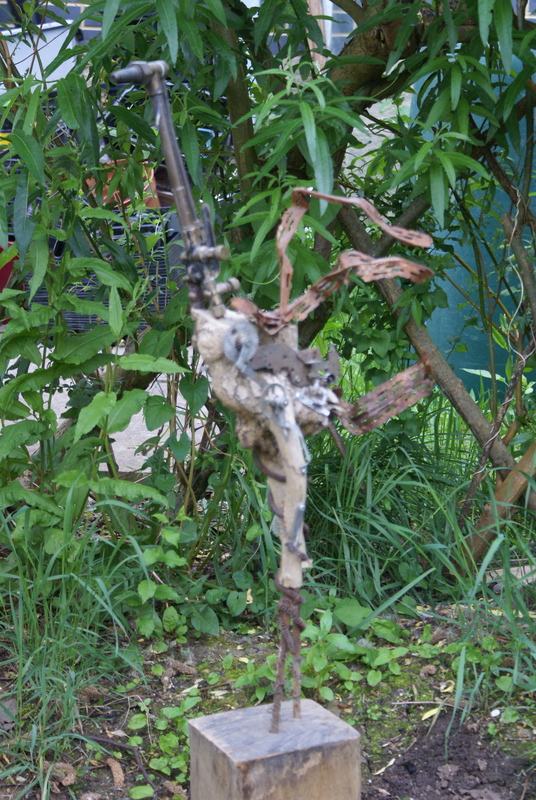 Entitled ‘Where is Iron John?‘, Palmer’s new body of work depicts images from his exploration of masculinity and the transition into manhood, inspired, informed and twisted from the iconic Grimm Brothers ‘Der Eisenhans’ fairy tale and it’s unique review through folklore and mythology by Robert Bly. From innovative photo-shoots Palmer reveals some of London’s most classical statues and sculptures that evoke personal representations of the fragility, serenity and the complexity of modern masculinity and its links to the male of yesteryear. Blended with images depicting the pace and expectation of inner-city modernity, double exposure images are replayed in paint and print creating works that are anchored in history whilst emphasising the pressure on the modern male. “Art-el Gallery is proud to represent Luke’s work in his principal London exhibition. His shows in Bristol have attracted a diverse range of admirers and collectors and we are delighted to have the pleasure to bring this work to the capital”. The Scottish writer and activist Alistair McIntosh once told me ‘It’s tough to be a young man in this world’ and he was right. Images of adult manhood given to us by popular culture and mass media appear worn out. The right man, the tough man, the true man, all of which have been force fed to us since birth and are neither accurate nor relevant to the real life of a modern male. When I recently became a father, my preconceptions of what it meant to be a man were flipped upside down. I found that the irreversible transition between boyhood and manhood had begun and with guidance from a long forgotten fairy tale, my most recent work explores key moments from what is perhaps the most challenging and turbulent time in any man’s life. 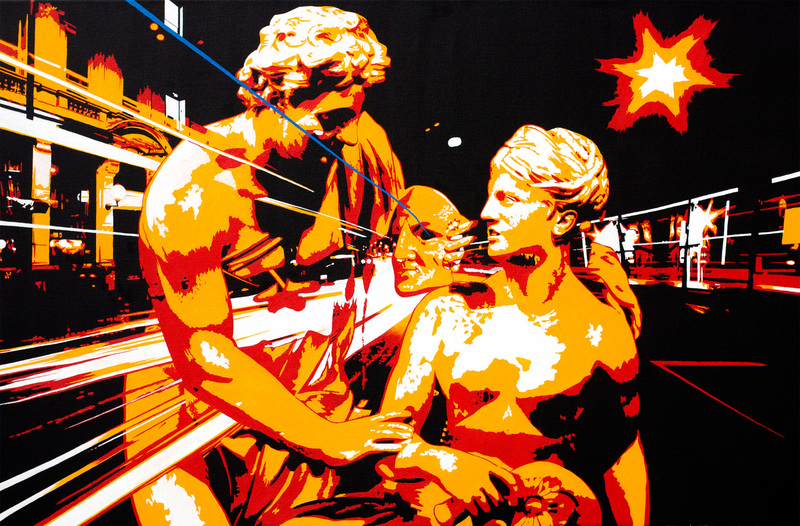 The collection of work comprises paintings that juxtapose imagery of London streets and statues of immortalised heroes, double exposure photography and installations that use images of light and death as an allegory for change. 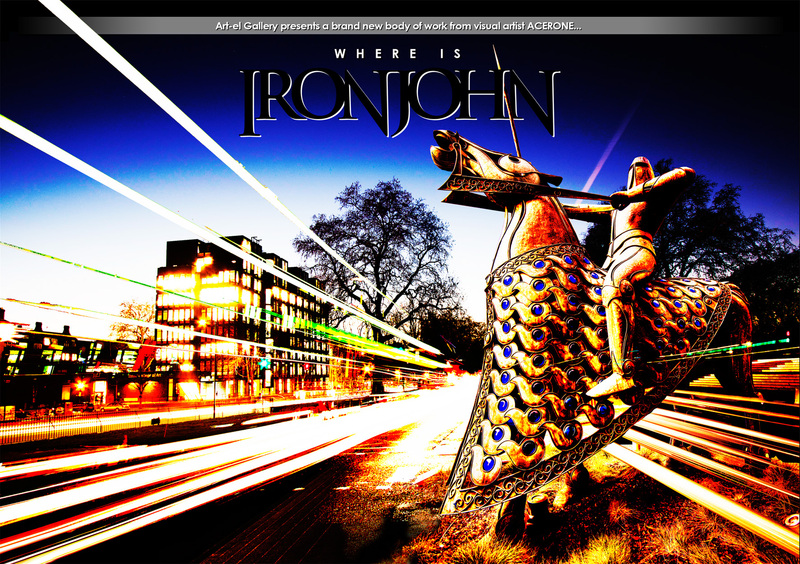 ‘Where is Iron John?’ is a visual representation of a young man dissecting masculinity whilst negotiating the complexities of modern life in the inner city. Acerone’s (Luke Palmer) paintings have been exhibited in a number of group and solo shows in his hometown of Bristol, as well as on streets and abandoned buildings in the UK and beyond since the mid 90’s. His recent gallery works are an accumulation of 17 years’ operating as a graffiti artist with the internationally recognised TCF Crew, whilst working as a freelance photographer and lecturer at the City of Bristol College. 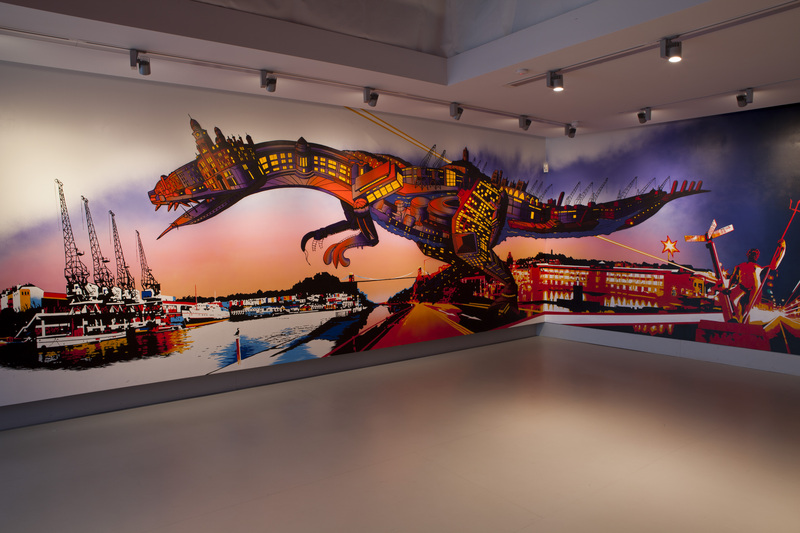 Blending together experimental photographic techniques, bursts of light and paint, Palmer’s innovative paintings capture the energy and vibrancy of his street based murals directly onto canvas. Palmer’s mural work can be seen adorning walls in and around the streets of Bristol as well as in many esteemed public institutions and private collections such as the Royal West of England Academy, Bristol City Museum & Art Gallery, the Tobacco Factory Theatre and the new M-Shed Museum in the regenerated docks area of Bristol. 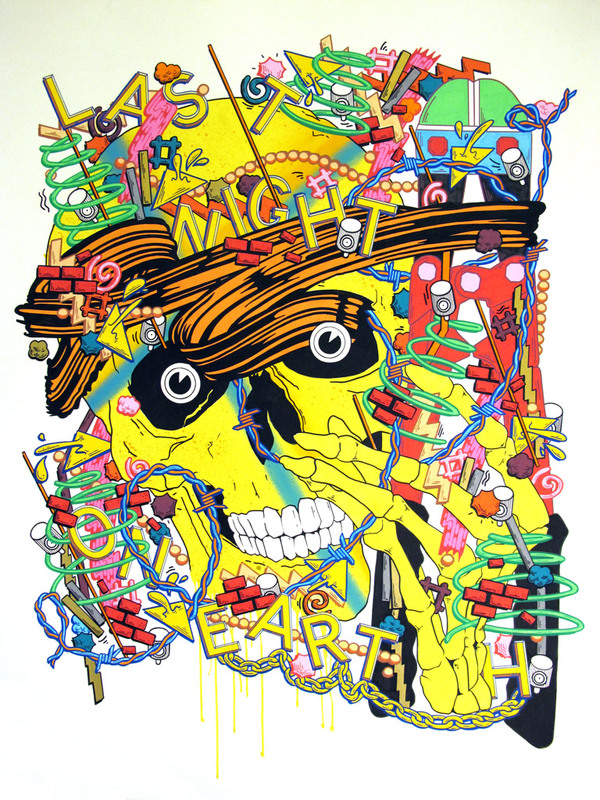 He has exhibited in two solo shows; ‘Call to Adventure’ at the Colston Hall, Bristol (2010) and ‘Photographiti’ at Friend & Co Gallery (2009) as well as numerous group shows including ‘See no Evil’ the ‘Weapon of Choice’ pop-up gallery (2011), ‘Crimes of Passion’ at the Royal West of England Academy (2009), and he also co-curated ‘Distance Travelled’ & ‘Triple Drop’ at the Centrespace Gallery in 2010 and 2009 respectively. In 2009 Palmer was the recipient of the first prize award in the ‘Bristol: A Second Look’ photography competition for his unique take on portraying the atmosphere of the city in a single image. With thanks to Bristol Beer Factory who will be providing the opening night refreshments. Tags:acerone, art exhibition, Art-el, Art-el Gallery, ‘Der Eisenhans’, Brick Lane, Bristol Beer Factory, Graffiti, Grimm Brothers, Iron John, London Solo Show, Luke Palmer, Photography, Robert Bly, street art, tcf crew, The Rag Factory, Where Is Iron John? It’s out with the old and in with the old at Art-el Gallery. Erms solo show ‘Everything Begins With An E’ opened with a bang on Friday evening, after a busy and tiring week putting it up – more to come about that soon. Pattern Interrupt, Mark Lyken’s solo show is down and has left the gallery, and the event seems like such a long time ago now. That said the show will live on in our hearts and of course on the internet! Lets take a little look back and how it all began. Thanks to Mark for having the faith and for agreeing to put on Art-el first solo show, all who help out putting the show up and all those who came to view and of course thanks to Joe Clarke for an amazing momento of the achievement in the form of this short film. Work from the show is now available on line at Art-el Gallery. 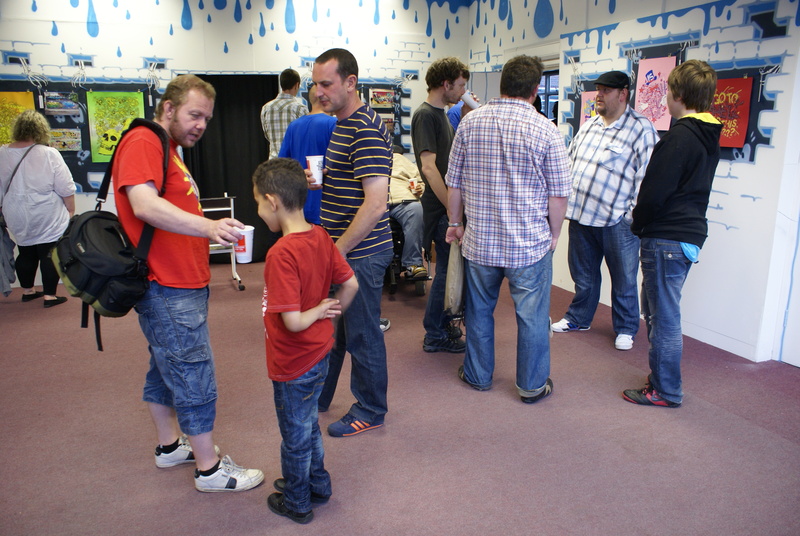 The College threw open it’s doors on Friday night as part of the Bristol Biennial (1st – 16th June). It was a hugely busy and succesful night attracting artists and the local community who took great pleasure in the vast array of art work and creativeness that was on offer, enjoyed walking the art and sculpture trail and then relaxed to the sounds of Yaffle and Insomniac Jack. This work can continue to be seen throughout the 16 days of the Biennial, but in order to take in the whole event it is best to save your visit for a Thursday, Friday or Saturday as this is when Art-el Gallery and Kathy Hindes, 1000 birds sound and visual installation are also available to view. Here is a little run thorugh & visual sample of what you can expect to see. 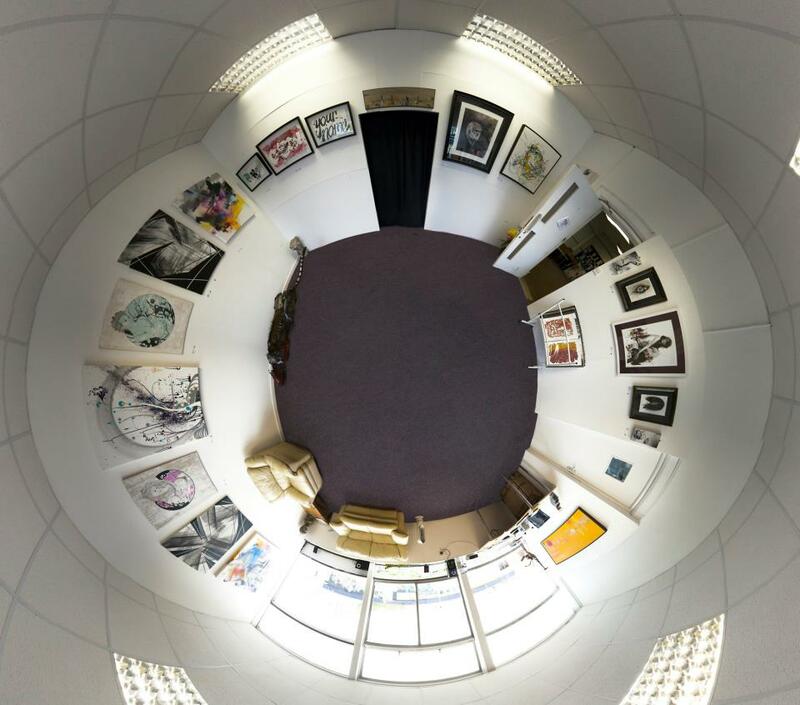 Explore the College site via the art and sculpture trial, there are maps and information available in the main exhibition space. In the main exhibition space there is a group exhibition of work from from the amazing and talented residents of the college, including sculpture by Pete Mountain, Matthew Billington and Lillith C Green life drawing by Colin Stevens (who also runs classes at the college), photography by Joe Clarke & Ashley Clarke and Stefanie Dring and painting by Kerry Day. 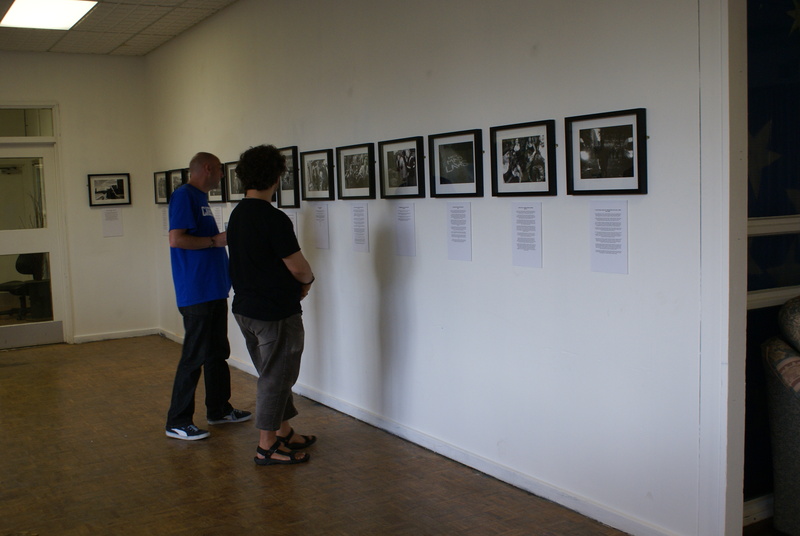 In addition there is a solo photography exhibition by Matt Smith (Mattko), 30 photographs both digital and exposed print each telling it’s own story called …. Open Thursday & Friday 11:30 to 17:30 and Saturday 12:00 to 16:30 is a sound and visual installation by Kathy Hinde and Matthew Fairclough. 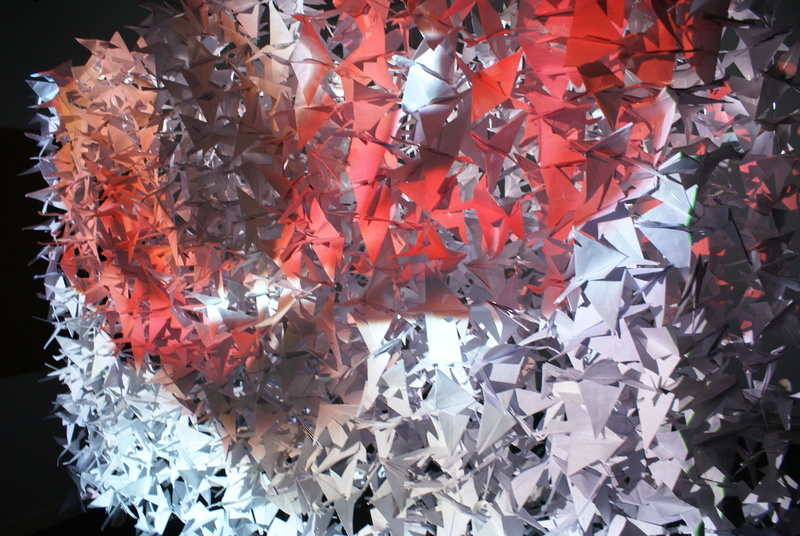 Many of the 1000 paper cranes used in this exhibit have been made by the local community. Also available to view on the same days and during the same hours is the Erms solo show ‘Everything Begins With An E’ in the Art-el Gallery. The shows own blog and further pictures coming here soon. So come down and check this out for yourself soon, it an amazing place and there is much going on. Art-el Gallery is delighted to announce‘Everything Begins With An E’, a new body of work from the Graffiti writer and illustrator Erms. UK born but now based in Paris, he continues to be active in the Parisian graffiti scene. Taking diverse influence from classical New York and European graffiti, renaissance art through to pop art, traditional graphic design and illustration, the 80s Hip Hop movement and beyond. Erms takes us on a unique aesthetic exploration of the alphabet, of complex patterns, grids and graphic style. The title for the show is inspired by the famous rave track of the same name. It also plays with the first letter of the artists moniker as well as having intrinsic links to the rave scene. 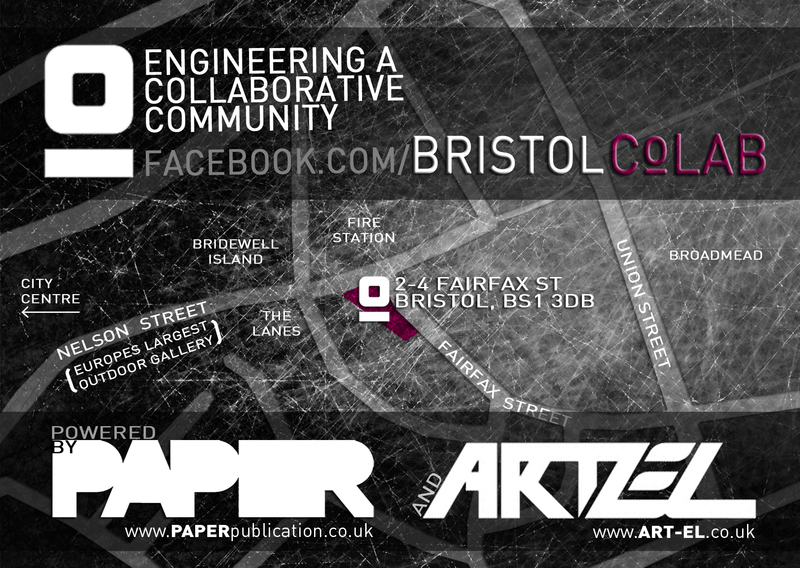 Happening alongside this, in conjunction with The College Project will be the opening off the Bristol Biennial with an explosive multi-media event showcasing an array of visual art by the college creative’s, including an art and sculpture trial, live music and refreshments throughout the evening. You will be blown away by the transformation of the old City of Bristol College, now a thriving artistic community in the midst of beautiful gardens. See below for what we have in store for you. The theme for this year’s Bristol Biennial is Storytelling, inviting participants to interpret the theme through visual arts, film and theatre. Storytelling exists in all facets of life: we tell stories and anecdotes to engage others and break down isolating barriers between individuals or groups. Storytelling can enrich our lives, it can be cathartic, it can impart wisdom or illustrate values and customs. Photographer Matthew Smith (Mattko) has been invited to showcase his vast body of work.Mattko has spent the last 20 years documenting social movements in the UK. Read an interview with Mattko and a review of his last exhibition in Crack Magazine. 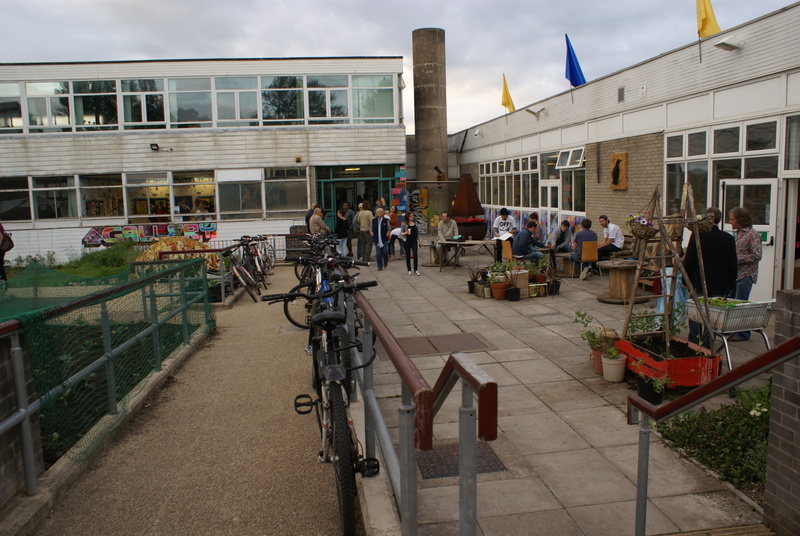 Alongside the exhibitions, there will be an outdoor art and sculpture trail from the College Project artist studio and workshop residents. Keep an eye out for the Immersive video, sound & sculptural installation By workshop resident Kathy Hinde & Matthew Fairclough called ‘A Thousand Birds’. 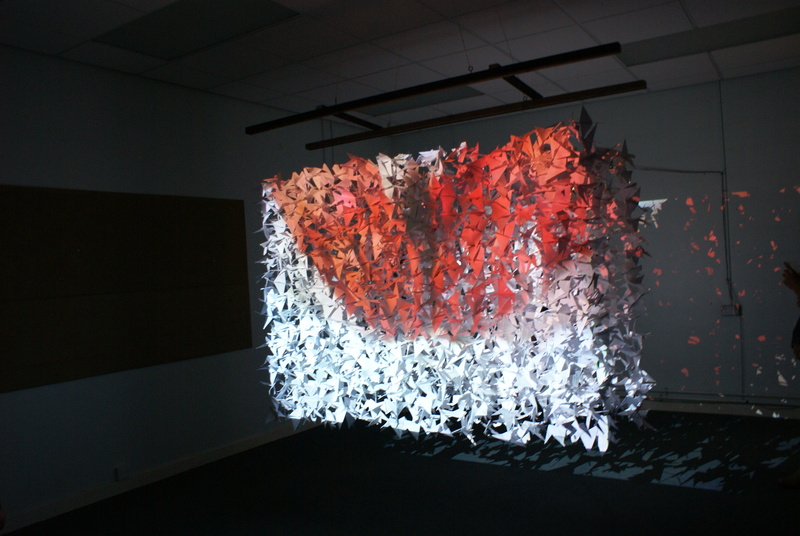 This work has been partly created by the wider community, who have been creating origami cranes for it. You can still participate if you follow the instructions on this video. The installation will be open for viewing at the at the same time as the gallery. 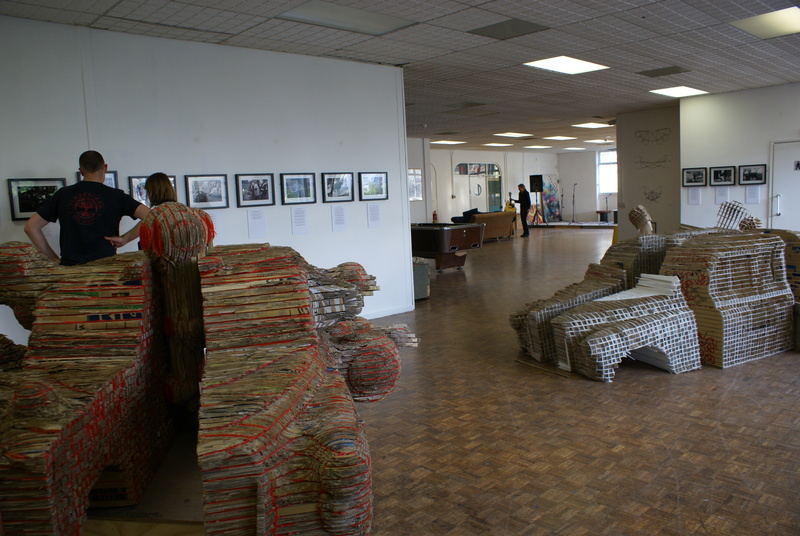 Other work will be available to view throughout the duration of the Bristol Biennial, 1st to 16th June. There will also be live performance on the evening of the 1st from musicians Yaffle (Benita Johnson & Helen Gregory) and Insomniac Jack and a circus performance in ‘The House of Curious Engagements’. See the Bristol Biennial website for all the related events throughout Bristol.